Norman Rockwell, the foremost chronicler of small-town American life in paint, wrote just one work of fiction, a children s story, first published in McCall s magazine in 1967. It was later republished by Funk & Wagnalls as a book, but this edition is based on Rockwell s original concept, complete with the color and monotone paintings he created for the story. Willie is a wood thrush but a very different kind of wood thrush. Driven by his intimation that he possesses a special genius, Willie leaves his avian fellows to take up singing with the exquisitely down-to-earth Miss Polly, flautist extraordinaire. Together they find fame, and they eventually travel to the nation s capitol so Willie s beautiful singing can be appreciated all the more. Yet all the attention and bustle of city life distress Willie and make him stop singing, so Miss Polly brings Willie back to his native woods, where he resumes his tranquil life and music-making with her. But the world remembers and reveres Willie and the genius of his song. 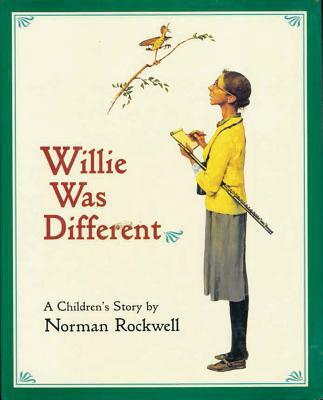 Share Willie s timeless story with the children in your life.